There are around 20,000 species of bees - only one of which is the common honeybee. They come in a myriad of colours, only a few species making honey and contrary to common belief, most bees don't dance and stinging does not necessary mean instant death - some never sting at all, including native Australian bees. Most people love the honeybee - not only for it's delicious honey and other bee products but its incredible powers of pollination - this has been thus for millennia. They come in many sizes - two Aussie bees are notably at the end of the spectrum in size for native bees. One possibly being the world's smallest (less than 2mm long) Euryglossina (Quasihesma) and Australia's largest native bee, the 24mm yellow and black carpenter bee. Just to give some prospective here, there is a monster from Indonesia which is almost 4cm in size (Megachile/Chalicodoma pluto) TWICE the size of our first mentioned little Aussie fella. Australia has approximately 1,600 species of native bees and they form the platform for major pollination of Australian native flora across the country. There are primary producers in Australia who are starting to use native bees for their crop pollination. Notably, (Tetragonula) which are being successfully used for pollination of crops such as macadamias, mangoes, watermelons and lychees in Queensland - they are especially valued for their pollination mainly due to their social behaviour of foraging close to their hives (within a 500m radius) and they are also a wonderful asset to greenhouse pollination because of their 'close to hive' pollination habit. Although it has to be said that honeybees are still primarily used as pollinators for other crops in Australia. 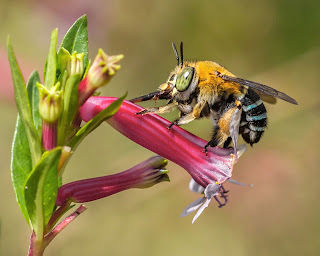 There are some amazing bee behaviours, for instance the blue banded bee (pictured above) (Amegilla) is capable of a very special type of pollination, called 'buzz pollination', (as can carpenter bees too). For some plants, the pollen is trapped inside a tiny capsule in the centre of the flower. The blue banded bee can curl her body around the flower and rapidly vibrate her flight muscles, thus causing the pollen to shoot out of the capsules. As she collects some pollen for her nest, she transfers some of the pollen to other flowers, successfully pollinating the flowers - amazing! By the way the introduced Apis mellifera are not able to buzz pollinate flowers.